Checking this will automatically print photos as they are downloaded. Uncheck it if you want users to select and print their own photos. This will limit the # of prints a particular user can get over a certain period of time. It's primarily used to prevent abuse. 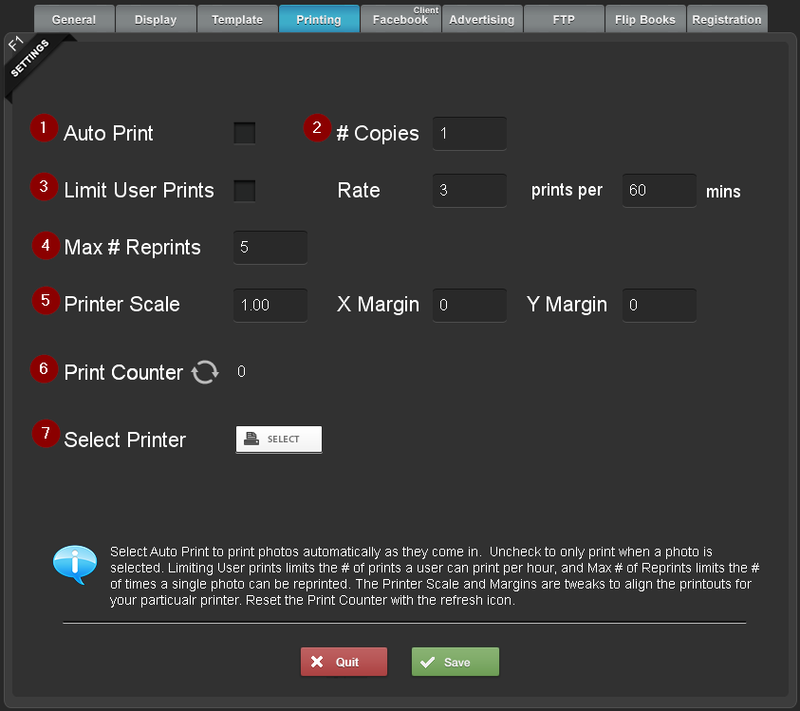 For example, you could set it so a user can only get 3 prints every 60 minutes. After 60 minutes, they will be able to get 3 more. Note: Be sure to be aware of having this setting enabled during testing, as you will reach the limit and wonder why your photos aren't printing. Another feature to prevent abuse. Setting this # will prevent a single photo from being printed more than the assigned #. This will keep a running tally of the # of prints. Useful if you are charging or limiting the # of prints per event. You can reset it by clicking on the icon next to the counter. By default, BYO Booth will print to the default Windows printer, that is the printer that is set to default in the Windows control panel. As an alternative, you can select the printer here. Video below covers print template selection, photo placement and sizing, portrait and landscape printing, auto print and number of prints.